Marlin “Bart” Barton’s fourth book in ten years returns us to the west Alabama environs that are his “little postage stamp of native soil,” to borrow Faulkner’s well-known phrase. The Cross Garden is a testament to the beautiful solemnities of place where roots both nourish and restrict growth. 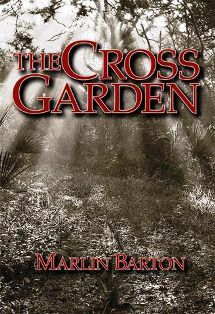 In precise prose and lyrical cadences, Barton limns the riverbanks and ironwork bridges, the camphouse lean-tos and cinder-block dives, the turkey-tail-clogged woodland trails and the ornate small-town architecture with such vivid density that Greene County comes alive as a landscape of both unbearable stasis and uncomfortable intensity. At the heart of the novel is the titular site, a bower of guilt where Nathan Rutledge memorializes a past crime in hopes of redemption and forgiveness. Clearly inspired by the late W.C. Rice’s folk-art shrine outside of Prattville, the cross garden nevertheless feels perfectly native to the countryside laced by the Black Warrior and Tombigbee rivers (here called the Black Fork and the Tennahpush). The real-life Rice’s crosses are baroquely decorated with Biblical sayings that sometimes whitewash their fire and brimstone with Howard Finsteresque eccentricity; those planted by Nathan, however, are powerful in their symbolic asceticism. They serve as stark reminders of the need to serve penance. A story of tangled generations, the plot centers on a surrogate father battle for the soul of seventeen-year-old James, an at-risk teen recently released from an Alabama youth detention facility. On one side is Nathan, boyfriend to James’ broken mother; on the other, the reptilian Puckett, owner of a shady sleaze den that fronts his crime-lord operation. The conflict between good and evil is almost Biblical in its clarity, but one strong virtue of the novel is Barton’s enviable ability to keep his characters fundamentally real even in the parable-like scheme of their opposition. The writing never veers into Gothic exaggeration or pulp cartoonishness. As a result, Nathan and James speak with a stoic resilience that makes their emotional struggles all the more fraught in their silences. Here, for example, is Nathan in his cross garden: “He walked to a point that he knew was beyond the cross garden and turned around and swept his light across where he’d been. Then he looked at his feet and saw a circle of bare dirt that he didn’t know how to account for. No animal had made it. He bent down and picked up a handful. It smelled of rot and fermentation. The earth always transformed what was entered into it, but that fact erased nothing. The very smell of the earth, the rot and decay in it, reminded him of what he’d done and tried to cover up.…” Such passages proliferate and account for the novel’s richly archetypal atmosphere. Kirk Curnutt is the Alabama Writers’ Forum board president and chair of the Department of English at Troy University, Montgomery Campus.